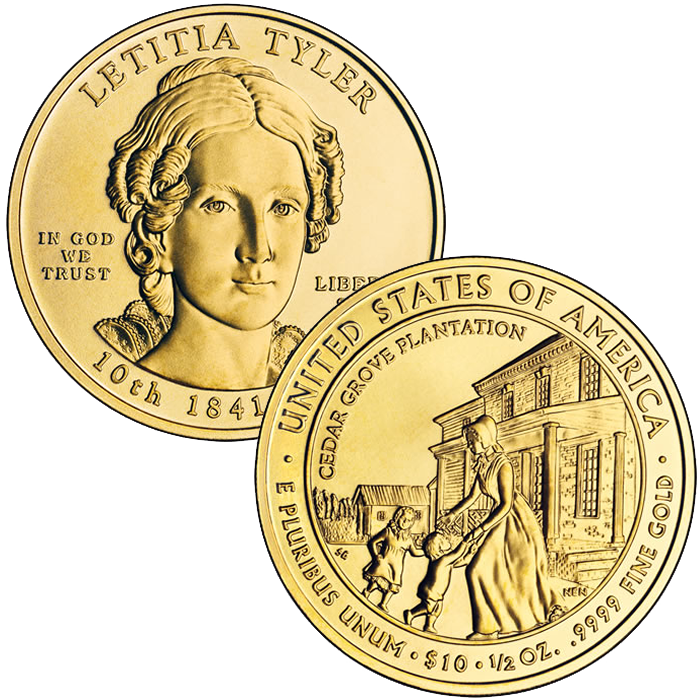 The 2009-W $10 Letitia Tyler First Spouse Gold Uncirculated Coin has the distinction of not only being the tenth coin in a series dedicated to the spouses of the former Presidents of the United States, but also the first one to be associated with a President who had more than one spouse while in office. Letitia passed away while her husband John Tyler was still President. He later re-married giving the country two woman who served as First Lady to John. The authorizing legislation for the Spouse series allowed for both women to be honored on separate coins. Proof quality versions of each of these strikes were also minted. Each First Spouse Coin is struck from 1/2 ounce of .9999 fine gold with a face value of $10. 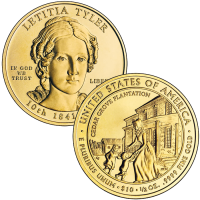 When first released, the US Mint charged $614 for the Letitia Tyler First Spouse Gold Proof Coin. However, the price fluctuated after that according to the Mint’s precious metal pricing matrix.